With hundreds of products vying for consumer attention in the supermarket aisle, only the best attention-grabbing product packaging wins. The product label can be the deciding factor for the consumer between buying or not. Don’t settle for plain labels. Create a label that is as unique as your product and as unique as you. Whether it’s for soap, shampoo, cosmetics, food, candles, or virtually any product, we can help you make product label perfect for you. Our product labels are available in two forms: cut-to-size and roll. 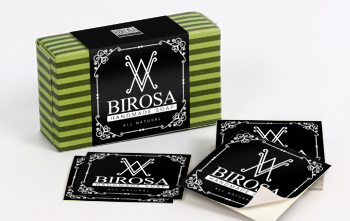 Cut-to-size product labels have a wide range of size options and are cut individually. Our roll labels are presented in a roll form for easier machine application. With our quick printing turnaround, you can receive your product labels as soon as the next day! Product Labels is rated 4.9 out of 5 by 11. Rated 5 out of 5 by Tayshis from EXCELLENT SERVICE & QUALITY I purchase my labels from here. Between the quality and customer service they never seem to disappoint me. Rated 5 out of 5 by tkh661 from Awesome service! Very easy to communicate with! Graphics and the colors were great! Rated 5 out of 5 by AlexM from Quick and Accurate The colors came out perfectly and everything looks as it should. Great job.